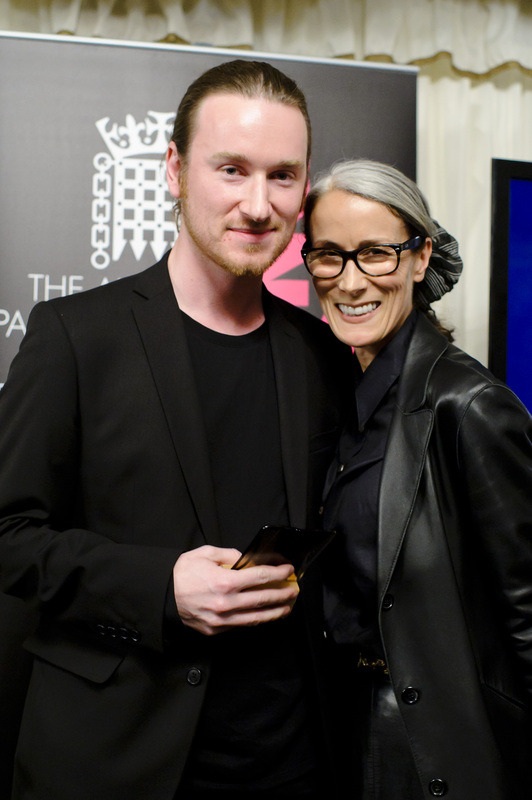 Mark Fast, the King of Knitwear, made a rare appearance at Parliament last week to receive a well-deserved award. The first ever Body Confidence Awards in association with Bare Minerals, presented by Jo Swinson MP, acknowledged Mark as a fashion leader for showing a range of body and beauty ideals within his London Fashion Week catwalk casting. The All Walks Beyond the Catwalk Fashion Visionary award has landed! We are of course delighted and applaud Mark Fast as a creative genius and just as importantly, a thought leader. His desire to create inclusive fashion messaging was something we all celebrated, back in May 2009, when Mark was amongst the first to accept the All Walks challenge to design a sample garment for a curvy model. Award winning photographer Kayt Jones recorded the iconic picture of Hayley Morley for i-D Magazine seen below, along with 7 other images featuring diverse models in dresses from designers like William Tempest and Hannah Marshall. It might have ended there, but Mark took things further. Launching Hayley Morley, along with other similarly voluptuous models like Laura Catterall, the Special K model, on his London Fashion Week catwalk the following September, Mark made national and then global News. In fact, the resultant press tsunami took everyone by surprise. The small All Walks HQ was inundated and after appearing three times in one day on the BBC News, Debra, Erin and I then realized the only way ‘fashion forward’ was to grow All Walks into the well connected organization it is today. As a result of that first campaign All Walks has launched the Centre of Diversity at Edinburgh College of Art and has gone on to create many more initiatives. And with lectures up and down the country, engaging student designers with the idea of conscious choice, emotionally considerate design and why designing for a range of body shapes is, in these difficult times, a lucrative business proposition, we know we can look forward to more high profile Body Conscious designers like Mark Fast, in years to come. “Over the years,” say’s Mark, “I have been privileged to work with some of the most beautiful and shapely women in the world and it is true to say that even the most beautiful (by any standards) have moments of doubt and insecurities. As a designer it is very important to deliver the technical aspects a “look” and a quality of “make,” I also want to make each wearer of my clothes feel empowered and affirmed. I want to celebrate women and make them feel good in my clothes. And more power to you Mister Mark Fast, for such stylish action. We know you will continue to win awards, but we hope this All Walks award has a special place on your studio shelf. We think you have heart and we think that you, like us, believe that Inclusivity and Diversity equals Body Confidence. Full list of the Body Confidence Award winners. Caryn’s piece on why the awards are important for every one, for The Huffington Post. Susie Orbach’s Guardian Feature on the Body Confidence Awards. Working in education throughout her career as external assessor and lecturer in colleges like Central St Martins, London College of fashion and Royal College of Art, she is also an ardent fashion activist and has co-chaired the award winning Fashion Targets Breast Cancer for 15 years and proposed the London College of Fashion Centre of Sustainability and is its ambassador.